Ruffian is the term for the manicure that features 2 colors and the second color starts further down from the cuticle. I haven't seen too many other names for this type of manicure so I'm going with it. 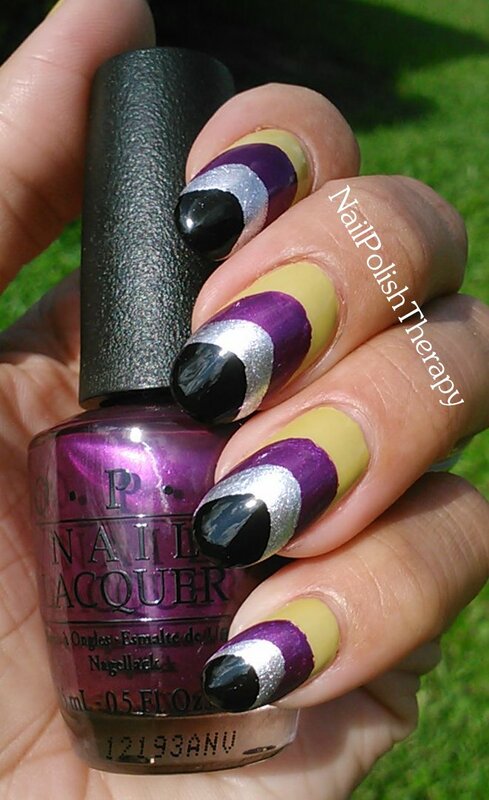 lol I recently bought 7 of the OPI Germany collection and was trying to create a look using two of the colors that I thought were pretty funky, when I decided to go crazy with the ruffian. I started out with OPI Don't Talk Bach to Me. A gorgeous light olive creme that went on like a dream. It reminded me of guacamole my absolute fav! The Suzi and the Seven Dusseldorfs gave be a bit of a problem because it was a little streaky and definitely not 1 coater. However I love the color. For this technique it is best to use 1 coaters so your lines come out crisp the first time around and you don't feel compelled to go over them.